Morgan James Publishing, 9781614485438, 148pp. SIMPLE. NATURAL. 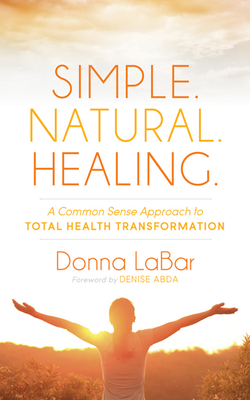 HEALING author Donna La Bar firmly believes in nutritional healing to reverse nearly every ill. She started teaching nutritional healing facts to friends and family over three decades ago. Everything snapped into focus the moment her daughter, age twelve, was diagnosed with advanced acute myeloid leukemia with two weeks to live. Instantly, all the research had tremendous purpose. Everything La Bar knew about recovering the body to wellness was implemented and put to the test. Her daughter's recovery changed her life and the lives of everyone La Bar has helped since that time. She has now coached others with terminal diagnoses and disturbing illnesses for decades, and the stories of their recoveries are captured in the pages of SIMPLE. NATURAL. HEALING. Readers will learn the importance of alkalinity, pH balance, and how to achieve it; the role enzymes play in health and how to easily support the body with them; and how to get sleep, reduce stress, and have better elimination to dramatically improve health. The knowledge and ability to heal the body nutritionally without special dieting is so empowering. It's the information our society needs right now. Reducing illness and healthcare issues is within our reach as individuals and as a society. SIMPLE. NATURAL. HEALING. demonstrates the way. When author Donna La Bar shares her thirty years of study into nutritional healing, her eyes light up and her beauty defies her true age. A lifetime resident of the rural Pennsylvania town of Tunkhannock, La Bar is sought after for healing information on cancer, arthritis, weight loss, and more. She believes in the body's ability to heal, when given the right nutrition, alkaline/acid balance, enzymes, environment, exercise, better sleep, and uniquely target stress reduction. An all-around full-force approach to health and wellness. Her gift? La Bar is a master of translating scientific healing health approaches into layman's terms. In the book SIMPLE. NATURAL. HEALING: Commonsense Approaches to Health Transformation, she shares how her daughter healed from an adult form of leukemia when she was a child and how others have found healing in alternative methods. La Bar receives calls for help every week from people who do not know where else to turn. Her gentle nutritional and healing guidance is recognized for its effectiveness, as shown in the stories she shares in SIMPLE. NATURAL. HEALING . She is self-taught in the field of medicinal properties of nutrition. Find out more about her life work at www.DonnaLaBar.com.